Ok ok I know Easter isn't for another couple of weeks so technically we are a little bit early on the Easter egg front but I do have a valid reason for this picture. 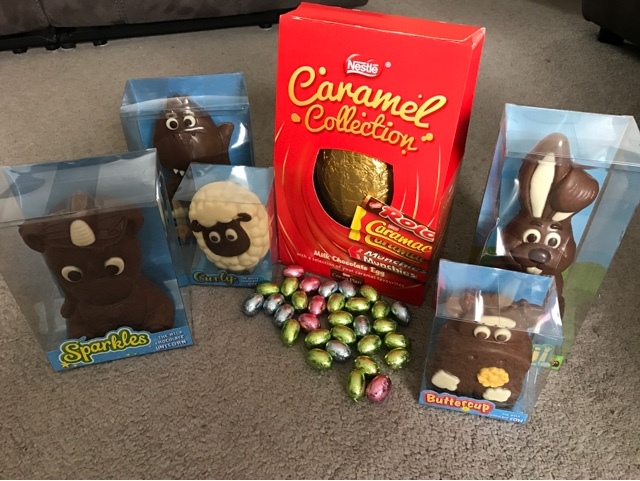 Our school held their annual Easter egg raffle this week and my eldest daughter happened to win the big prize as well as an extra egg, lucky girl. But would stood out about this moment was her generosity shining through because when she collected her prize the teachers happened to hear her say, "this is for my girls", meaning her sisters. I'm the lucky one having such kind and caring children! What a fabulous selection to win, and how generous of your daughter to share. Is it wrong that I want to eat that all at once? Mm the chocolates! The sheep is so cute! Aww! What a lovely, thoughtful girl you have! Aww you have a very lovely girl there and that Caramel egg looks delicious!